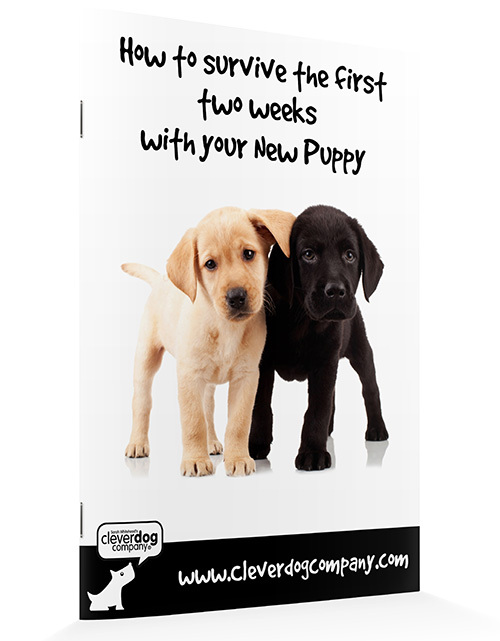 Puppies which live with other dogs need more socialisation, not less! If your puppy would rather play fight with his buddy than listen to you, you need to take action NOW! Pretend this is your only dog! Some ten years ago, my behaviour practice reviewed our cases of dog-to-dog aggression. We looked for common factors in adult dogs which showed aggression to other dogs out on walks, and came up with some rather surprising results. These indicated that second dogs were much more likely to develop such problems than ‘only’ dogs in the home! Our experience is that a puppy coming into a home where an older dog already exists needs more socialisation with other dogs, not less, and he needs to do this on his own, without his new friend there to back him up. This means getting him out and about to meet and mix with other dogs on separate walks and excursions as often as possible. Your pup will never learn to stand on his own four paws unless you invest in him individually now. Action! Get your puppy out and about on and off lead in the park by himself every day! Aim to meet 6 dogs (yes, 6!!) every day! In order to protect your new puppy from becoming a spoilt little monster, it’s vital that he should learn to respect his elders! Allowing the pup to pester an older dog that won’t tell him off is simply telling your puppy that this is acceptable behaviour with all other dogs – and is going to get him into trouble in the park before he’s too much older. If your existing dog can’t or won’t discipline the new puppy appropriately, then you must step in and break up the action. Such intervention needs to be frequent and consistent. There’s no need for punishment, just halt the fun. Action! Don’t let your puppy learn to enjoy bullying. Intervene frequently between your dogs playing, especially if your older dog seems too tolerant. Play between dogs is a form of arousal – and as such it can easily tip over the top. It is also highly enjoyable – even addictive. The consequence of this, is that it may become your new pup’s main focus – to the exclusion of you. Your aim should be to build a real bond with your new pup, and not just act as a poor substitute for your other dog. Of course, dogs are more likely to bond with their own species rather than us if possible – we are slow-moving and dull in comparison! For us to build a good relationship with a second dog we have to battle against the natural laws of social animals, and make ourselves more important than another dog – and this means interrupting and even limiting the amount of play they have together. Action! Spend time training, playing with and grooming your puppy without your adult dog present. Build that individual bond with him or her now – don’t leave it until it’s too late.